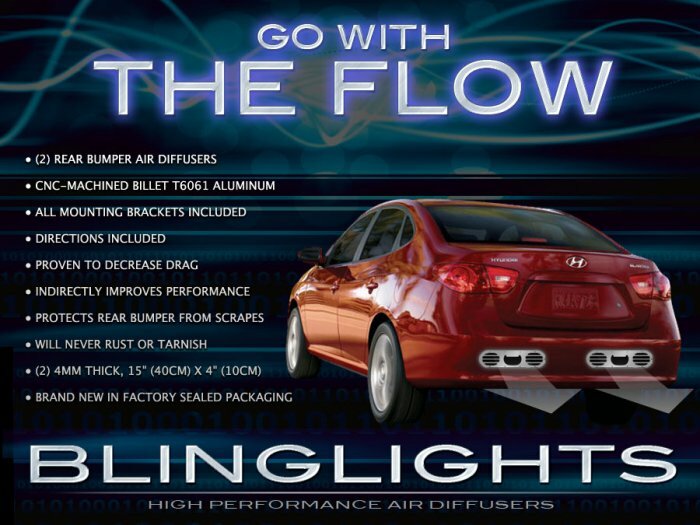 BlingLights rear bumper air diffuser made of CNC-machined billet t6061 aluminum. Inspired by new Ferrari design provides decreased wind drag for improved performance and fuel economy. For the diffusers to be functional openings must be made in the rear bumper. These Diffusers then mount over the openings and fasten in place using the included mounting hardware. The vents in these air diffusers will allow the air traveling under the vehicle to escape with less drag. Recent wind tunnel studies on the aerodynamics of most vehicles found that drag at the rear of the vehicle is the highest. As the car moves forward wind travels under the vehicle creating a siphon effect as large volume of air exits the rear. Diffusers create an outlet for the air to escape dramatically reducing drag at the car's most vulnerable location. To counteract the vortex effect Ferrari has added oversized rear air diffusers and so has many other performance vehicle manufacturers. Does the kit include everything I need? Yes, the kit includes 2 diffusers, all mounting bolts, directions, factory sealed retail packaging, and more. What is the return policy? You are entitled to a full refund if item is mailed back within 30 days of receiving item. Item must be in the EXACT brand new condition it was received along with the order number and reason for return. No pre-approval necessary. Accepted payment methods; credit or debit cards, googlecheckout, bank or cashier's check and money order. All payments must be made in US dollars. No personal checks.